Steve’s Real Food now offers their easy to feed nuggets in a 9.75 lb. box. 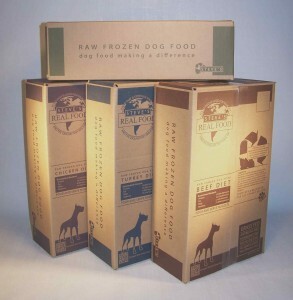 Offering four complete and balanced raw frozen dog food formulas at an excellent suggest retail price of around $33.00. That translates to $3.38 per pound (most raw pet foods run between $4.25 and $5.00 per pound.) Inside the eco- friendly box you will find two bags for easy storage in your home freezer. Steve’s Real Food, a small family run business has maintained affordable pricing over the past 14 years by keeping administration costs low and maintaining a controlled marketing budget, without compromising quality or ingredients. Your body does better and feels better when you eat fresh food, so will your dogs and cats. If you are new to raw pet food, I encourage you to give it a try. It is easy and you can do it affordably. Pick your monthly budget, purchase that amount of raw food and spread it out and make it last a month. You can mix it with your high quality dry food , simply reduce your dry food accordingly to add the raw. There is no arguing, fresh food is good for our pet’s health. Steve’s Real Food is also available in 5lb bags of nuggets or large patties for dogs, 1.67 lbs. bags for cats. Learn more about Steve’s Real Food and the benefits of raw at Steve’s informative website. Find Steve’s Real Food near you or ask for it from your Solid Gold Northland retailer. Contact us if you have questions about using raw food in your pet’s diet.